Time flies, and I'm already 5 months into my Invisalign journey. I congratulate you if by now you have already hopped on and made the decision to straighten your teeth with Invisalign. For the rest who haven't, there are many points to consider about, that I have mentioned before here and here. Invisalign can be a costly treatment. You can find out more details on how to make the treatment more friendly on your pockets with i.Dental - which is where I got them done! Besides that, one has to be ready to throw in sheer dedication because there is no half-effort. At the end of the day, it will be all worth it for that confident and beautiful smile you have perhaps been hiding from a crush. Invisalign has been constantly improving through investments in Research & Development. One of the innovations of Invisalign is the SmartForce Features, which are engineered to deliver the force systems to achieve predictable tooth movements. I know it sounds pretty confusing, but there are tons of videos that will further explain what I’m referring to, on the web. I'm at the stage of the treatment whereby I am required to have these tiny deposits on my teeth called 'attachments' - one of the SmartForce features. These tooth-colored bumps provides an anchor point, that helps to direct the forces of my aligner more effectively to my tooth as some tooth movements will not occur with just plastic aligners. The attachments are hardly noticeable even on a closer look. The experience in the beginning can make one feel uncomfortable (imagine something on your teeth then you cannot remove) but I promise the feeling goes away after a day or two! The discomfort will eventually go away and you will be used to taking the aligners in and out your teeth to brush and floss. No pain, no gain right? It also motivates me to feel like my teeth are slowly moving into the right place, and the thought of that makes me excited each time I receive a brand new set of aligners. I had a checkup with Dr. Cheng just a few days ago and we’re both pleased to know that my treatment is progressing well. 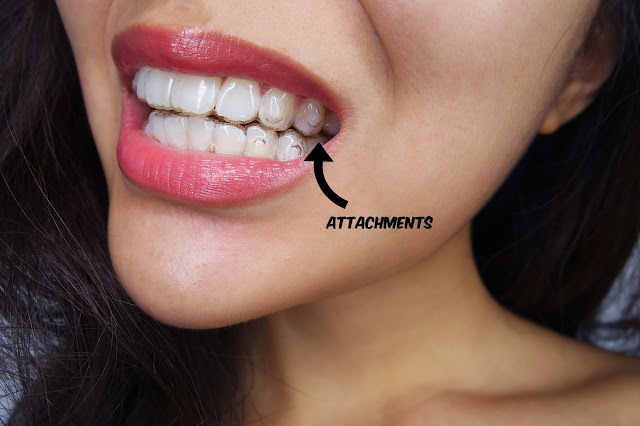 Not everybody gets the attachments placed on their teeth. Some might receive more than others, while some are not even required to have them. The dentist will determine for you accordingly if your aligners will slip off the tooth surface or having them will aid/accelerate teeth movement. The list of doubts, worries and concerns people have for Invisalign will go on and on. In general, maintaining a healthy wear-time and developing it into a good habit will certainly see you to a rewarding end of the journey. The best way to erase any doubts is to clear them with the professionals at i.Dental Invisalign Dedicated Clinic. Did you know that i.Dental is the flagship Invisalign clinic in Singapore? They are of a Diamond Provider status (Which is the highest in Singapore so far based on the number of cases they have treated). To make an appointment, call 6323 2813. The quality of your photos are amazing. Great results Eunice! Did you know you can create short links with AdFly and make cash from every visitor to your shortened urls.